Portland Oregon: front end shop suggestions? We're on the Oregon coast and heading to Portland tonight and tomorrow. My SMB has a front end or wheel/brake noise that I want to have checked out before we head into Canada. I'm thinking a Les Schwab shop, or maybe a Firestone (for wider possible warranty service if needed) but are there any recommendations for a good one in the area? Thanks! I second your initial thoughts on Les Schwab. If you're going to be in Eugene I could recommend a place or two here but they are smaller shops and it could be tough to get in on short notice. If you stop around here though they could be worth a try. Nothing wrong with Les Schwab. But I like Ron's Front End, 5912 SE Foster Rd. It's a nice shop with lots of experience. Look them up on Yelp. Thanks. It's just a slight noise and not sure whether it's brakes or suspension. Just want it checked out before driving up through Canada and back to Pennsylvania. Yeah, I would do Les Schwab's also. South Corvallis, Albany, and Hillsboro (Imbrie Parkway, aka Ronler Acres) are all good stores I use regularly. We're staying tonight at a Comfort Inn in Beaverton and driving in to Portland tomorrow. Any good Schwabs on the west side? Not familiar with Portland at all... would be nice to be able to drop off the van and still get into the city somehow (transit or our bikes via bike path?). Really appreciate the help and fast replies! Wish the Les Schwabb here were worth recommending. Buncha crooked asshats at the stores here. They try to pull some real crap with people here. If they didn't have such an easy credit line they would go belly up in this town. Yeah, there's one in NW Beaverton is good too. It's on 158th and Walker Road, in the Fred Meyer marking lot (The other Beaverton locations are usually way to busy all the time). From there, it's less than a mile bike ride to the Elmonica/170th MAX station, and you can go to downtown or just about anywhere by rail from that point. There's also a bus stop at that corner, which will also take you to the MAX Station. Bikes are welcome on both trains and buses but buses can only take 2 at a time. Trains can carry dozens... Just roll on and hang it from a bike hook. If you don't take you bikes, but decide you want to ride around once you get downtown, theres orange BikeTown rentals scattered everywhere around the city. Thanks! We'll see where we can get in tomorrow morning. Might want to try Ziggys on Canyon Road in Beaverton. They use to have the best reputation for any shop on the westside of Portland. 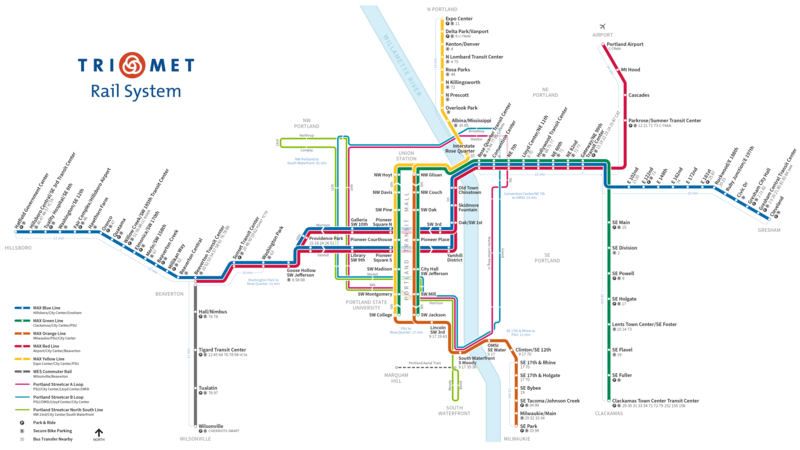 You can jump on Max the light rail into downtown Portland pretty easy from North Beaverton.